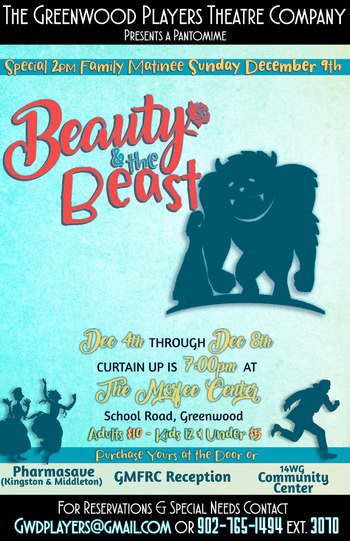 The Greenwood Players Theatre Group now in its 64th year presents a pantomime, BEAUTY and the BEAST. After refusing to marry the evil sprite ‘Belladonna’, our hero Prince is condemned to live his life as a frightening beast. Living all alone, apart from his faithful housekeeper Mrs. Hudson, he paces throughout his lonely castle, growing more bitter as the years pass by, shunning the world outside. The only way the curse on the Prince can be broken is for him, as the beast, to find true love. Fate sends him a guest, a beautiful girl whose name is Beauty. Beauty’s father loses all his fortune, much to the displeasure of Beauty’s two spiteful sisters, and the family have to move to a small country cottage. Despite Belladonna’s wicked scheming Fairy Rose, the good fairy, thwarts her at every turn. Lucy Lastic, the housekeeper to Beauty’s family, attempts to keep all in order as the plot unfolds. Our pantomime is a wonderful love story, with beautiful songs and lots of laughs too. Directed by Patrick Luoma, assisted by Jeff Pocock, who also designed the sets, Beauty and the Beast, the pantomime, is a must see treat for all the family.